Condemned for a murder he had not committed, Henri Charriere (nicknamed Papillon) was sent to the penal colony of French Guiana. Forty-two days after his arrival he made his first break, travelling a thousand gruelling miles in an open boat. Recaptured, he suffered a solitary confinement and was sent eventually to Devil's Island, a hell-hole of disease and brutality. No one had ever escaped from this notorious prison - no one until Papillon took to the shark infested sea supported only by a makeshift coconut-sack raft. In thirteen years he made nine daring escapes, living through many fantastic adventures while on the run - including a sojourn with South American Indians whose women Papillon found welcomely free of European restraints! 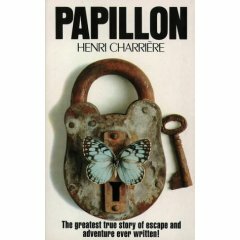 "Papillon" is filled with tension, adventure and high excitement. It is also one of the most vivid stories of human endurance ever written. Henri Charriere died in 1973 at the age of 66. Charriere really became a elebrity after this book and was seen with the likes of Frank Sinatra and all. But an earth quake at the place where he lived robbed him off his wealth and he got some of it back by coming up with the sequel Banco.If you folks are interested you guys can also take a look at the sequel. But I must say that it is not as exciting as Papillion. Thx for the feedback. I have seen the film too but I somehow feel the movie does not do justice to the book. But yeah on second thoughts there is only so much a movie can include within the limited time frame. I will try to watch Shawshank redemption when I get time. It's just that I haven't gotten an opportunity yet to watch it. Btw it would have been good if you could have left your name.